KEW manufactures, exports & supplies precision quality BOPP Adhesive Tape Printing Machine, Rotogravure Printing Machine, which is suitable for printing plastic and paper packing materials like Polyethylene, Polypropylene Bag, Cellophane, Paper Roll, BOPP Film, LDPE, OPP, etc. from Ahmedabad, Gujarat, India. 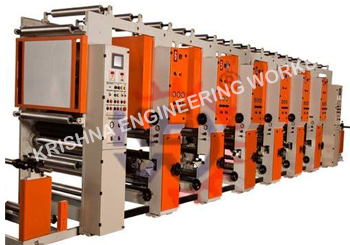 KEW Rotogravure Printing Machine, BOPP Adhesive Tape Printing Machine are the most suitable & efficient printing Equipment for Printing of Paper Bags, Plastic Bags, Milk Pouches, Food Bags, Super market Hand Bags, Vest Bags, Cloth Bags, Confectionery Wrappers, Film Pouches, etc.